The final game of the day saw Christopher's and Donegal play out a draw, a result that was fair in the end. Neither side got a hold of the game, and there were chances to win it at either end that went amiss. The first half was fairly uneventful, with Christopher's taking the break two points to the good. Mark Delaney got Christopher's off the mark, and Niall McConnell answered with a free for Donegal. After Chris Brady and McConnell traded points from frees Christopher's got the upper hand in the game. Dan Kenneally was a great outlet on the edge of the square and the big man caused problems for Christopher's back line breaking high balls and getting a point of his own at one stage. Donegal had some promising moves that broke down in the final third, but would be playing with the breeze in the second half. Donegal got off to a great start to get the second period going. Four unanswered points put them two points to the good before Christopher's recorded their first score of the game with 15 minutes gone. After a Chris Brady free that broke the duck for Christopher's, Gervase Toner won the ball on the edge of the box and turned, with his shot finding the back of the net. Donegal answered with a well taken Eamon McCarney goal, McCarney slotting the ball into the far corner soccer style as he somehow ended up totally unmarked at the far side of the goal. Mark Delaney then leveled the scores with a point from distance, and with 10 minutes left it was all to play for. After Dan Kenneally and McConnell traded points, it looked like Michael Mennis might have got the winning point for Christopher's from center back, but the biggest chance of the game fell to Christy Bell at the death. Bell was found all alone with the keeper to beat, but his shot flew an inch over the crossbar to square up the scores, and as it turned out, the final result. A fair ending to the game, but both teams will have to improve in their next outings. Christopher's: J. Howard, C. Lordan, C. Murphy, E. O'Neill, M. Mennis (0-1), M. Hunt, M. Delaney (0-2), P. Kenneally, G. Toner (1-0), J. Horgan, C. Brady (0-3), D. Kenneally (0-2), P. Manning. Donegal: S. Connolly (0-1), P. McNulty, S. Doherty, M. Canning, P. Moynihan, E. Doonan, T. Gallagher, P. McLaughlin, C. Bell (0-1), D. McDaid (0-1), P. Quigg, E. McCarney (1-0), N. McConnell (0-6). The best performance of the day came from the Shannon Blues who got their title defence off to a flying start with an impressive win over the Wolfe Tones. The Blues looked the fitter side and played a nice brand of running passing football. Goals from Kieran Hurley and Richard Blaine put the game beyond their opponents. Shannon Blues were in the ascendancy for the first 30 minutes. Kieran Hurley returned to the fold for another tilt at the Boston championship, and made his mark at corner forward with a well taken goal off the bottom of the far post. The Tones started well and pointed twice through Collie Carr, but from then on the forward line was kept quiet by a close marking Blues defence. The Blues tallied all of their first half scores uninterrupted. Points from Hurley, Anto Duffy, Barry Hartnett, and Patrick McCarthy put the Blues firmly on top. The Tones finished the half with a point from center back, Johnny Kelly to make it 1-5 to 0-3 in the Blues favour. The Tones had reason to hope for better things as the breeze would favour them in the second half, but it was not to be. The Blues continued the running game and played it with great effect opening up the Tones rearguard on several occasions with some slick passing. Early in the half one such move led to a Hurley goal, the final pass supplied by Pat Murray. The Tones answered with a right away Sean Kelly goal, but there was a six point gap at that point that could not be bridged. Patrick McCarthy points for the Blues. In spite of Cormac Joyce-Power pointing twice for the Tones who attempted to lift themselves, the Blues looked in control of affairs. Hurley pointed twice more and was followed by Duffy before Blaine hit with a third goal for the Blues. Even when chances presented themselves in the form of frees, the Tones failed to capitalize as there were a couple of uncharacteristic misses from the usually reliable Carr. With 10 minutes to go it was a nine point game, and it was as good as game over. A great start for the Blues, and for the Tones it is hoping for better in the games to come. Tones: C. Hynes, S. O'Hagan, B. McShea, M. O'Brien, J. Kelly (0-1), S. Higgins, C. Joyce Power (0-2), G. Brilly, M. Kelly, D. Egan (0-1), C. Carr (0-2), D. McCabe (0-1), S. Kelly (1-1). Shannon Blues: D. O'Brien, G. Ryan, K. Hartnett, P. McCarthy (0-1), S. Brosnan, S. Moriarty, P. Murray, B. Hartnett (0-1), S. Kavanagh, R. Blaine (1-0), A. Duffy (0-4), A. Glennon (0-1), K. Hurley (2-4). Kerry ground out a win over a disappointing Galway in their first outing of the season. Kerry did enough to win the points as Galway sputtered through most of he hour. Aaron Hickey in the middle of the field and Colin Campion at center forward did well for Kerry. Galway launched a late effort to get something from the game, but it was not enough as the Kingdom took their first points of the season. Playing with the favour of a stiff breeze, Kerry dominated the first period as Galway struggled to find any kind of rhythm to their game. Kerry held firm at the back and did not allow Galway a score over the first period, while their own forwards tallied a goal and three points. It could have been more, but with minutes left in the half, Martin O'Connor pulled off a point blank save from Colin Campion to deny Kerry a second goal. Kerry's goal came courtesy of a penalty taken by Joe Fitzpatrick. Campion won the penalty as he was tripped while about to shoot. Galway tried to play a short passing game but might have been better advised to try the longer ball into a starved Kevin Cummins to feed on as time and again play broke down in the final third of the field. At the break it was 1-3 to no score for the Kingdom. Galway got on the scoreboard in the second half thanks to two points from Jamie Kehoe; a comeback seemed like an impossible task at that stage. Aaron Hickey and Joe Fitzpatrick maintained the gap between the teams with a point each. With time ticking away the outcome seemingly decided, Galway made a late push. Kehoe, Donal Redmond, and Danny Reddin each pointed to leave a goal in it as Kerry waited out the clock. Galway had a late chance to level the scores, but Kehoe's close range shot was deflected over the bar, and with that the final whistle sounded. A win is a win from a Kerry standpoint, while it will be back to the drawing board for Galway to figure out how to get more out of their next game. Galway: M. O'Connor, P. Cummins, S. Gallagher, S. Conneely, P. Ryan, D. Redmond (0-1), JJ Doyle, E. Kavanagh, P. Nolan, J. Campion, J. Kehoe (0-4), K. Cummins, D. Reddin (0-1). Kerry: P. Bailey, M. Godley, D. Dunne, C. Schwer, S. O'Driscoll, D. Clifford, I. Whelan, A. Hickey (0-1), J. Dooley, C. Campion (0-2), P. Doyle, D. Collins, J. Fitzpatrick (1-2). The weather broke to greet the Connemara Gaels and Aidan McAnespies who opened the senior football championship. It was dry, but cool and breezy and the main field looked in immaculate shape. Though not a masterpiece, it was an evenly contested 60 minutes and full of excitement with the result in doubt until the 60 minutes had passed. McAnespies looked like they might shade the win after Barry Smith pointed with normal time almost up, only for Michael Lundy to hit the back of the net from inside the box in injury time. At the end of the first 30 minutes of football the Gaels held a three point advantage thanks to a penalty after 10 minutes. Corner forward Kevin McGrath, who worked hard all through, was fouled in the area and Sean Conneely expertly put the spot kick away. The Gaels came out the stronger of the two teams, and points from Noel Graham, McGrath, and Trevor Mullins had the westerners in an early four point lead. McAnespies worked their way back into it. Barry Smith and Gareth O'Neill gained a foothold in the middle of the field, and the gap closed to two points with scores from O'Neill and wing back Aidan Lynch. The sides traded scores to open the second half, which was a stop start affair. 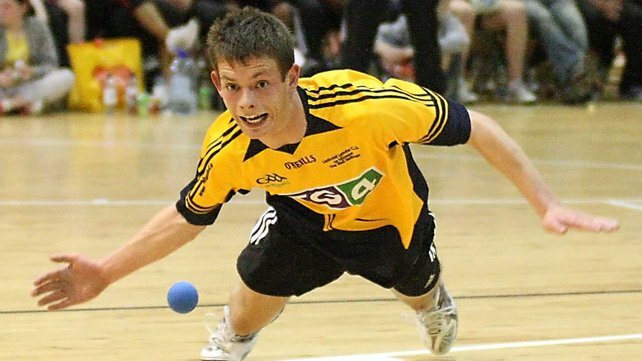 Smith, Ciaran McClean, and Tobin pointed for McAnespies, while for the Gaels it was Graham and Conneely who put three over between them. After Kevin McGrath extended the Gaels lead with a well taken score, McAnespies struck with a goal. Gareth O'Neill who had moved to an advanced position early in the second period won posession in the box, sold a trademark dummy, and netted from inside 14 yards. The score was followed by a fisted point from Tobin and a great effort from 30 yards by Barry Smith. With McAnespies ahead by a point it looked like the win was heading their way, but Michael Lundy had the final say. Noel Graham was found on the wing and fed Lundy who beat his man and fired home. First blood to the Gaels who meet Kerry in their next outing two weeks from now. Macs: P. Coakley, M. Bogue, E. Delmar, N. Gallen, C. McClean (0-1), A. Lynch (0-1), C. Dempsey, A. Phearson, B. Smith (0-3), G. O'Neill (1-1), E. Hamill, D. Brolly, C. Tobin (0-3). Gaels: E. Connolly, D. Doolan, C. O'Donnell, J. Purcell, E. Gorman, C. Seoighe, T. Mullins (0-1), N. Graham (0-3), S. Conneelly (1-1), T.McDonagh, M. Lundy (1-0), K. McGrath (0-2), J. Geoghegan. I spoke with Denis this morning regarding the latest GAA developments in Boston. The Boston senior football championship kicks off next Sunday, May 26. The 2013 championship will feature eight teams, all of which will be in action on Sunday. The playoff format remains the same as previous years with the top two teams into the semi-finals, and the next four in quarter final playoffs. First up are Aidan McAnespies and the Connemara Gaels. McAnespies, who won this year’s Pat O’Brien Cup, last won the championship in 2011, going unbeaten all season long. Last season McAnespies appeared dead and buried late in the year, but made a run to the semi-final where they lost out to the eventual winners, Shannon Blues. The Gaels missed out on the playoffs in 2012 but will be hoping will be hoping for a good year, especially with some good additions to the home based ranks. The Connemara men will be looking to go one better than they did in 2011 when McAnespies beat them in the championship final. 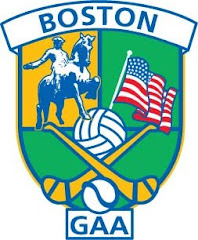 The second game features Galway and Kerry, Boston’s two oldest clubs. It has been a while since these clubs have seen Glory. Kerry last won the championship in 1999 amid some controversy, and have struggled to emulate the glory days of the 1990s since then. For Galway it has been even longer, Galway’s last senior football championship victory was in 1989. Galway have knocked at the door the last two seasons, reaching the semi-finals. This is an important game for both teams to get some early championship points. Champions, Shannon Blues, start their defence of the championship against the Wolfe Tones. After a couple of years of putting in a big effort, the Blues finally tasted glory last year and beat a highly fancied Donegal side in an epic final. The Tones on the other hand have never contested a senior football final, though the Blue and Navy side have fielded teams full promise. The Tones will be looking for a much improved performance since the disappointing outing in the Pat O’Brien Cup Final last weekend. The final game of the day involves Donegal and Christopher’s. Donegal’s season ended in bitter disappointment last year, and the northerners will be looking to regroup. Donegal pride themselves on being one of the signature clubs in town and an early win will settle the ship. Since bursting on the scene at senior level in 2009 with an unexpected championship win, Christopher’s have the look of a club hungry to repeat that success. Christopher's home based ranks have also been added to this year and they will be hoping for big things this season. While we are only getting off the mark, early season points are important and where the early season work pays off. Lots of questions to be answered. Will the Tones finally make the breakthrough? Can Christopher’s taste glory once again? Will it be Aidan McAnespies winning the championship for the seventh time in their eighteen year history? Can Galway or Kerry restore the glory of past years? Will Donegal make up for last year's disappointment? The answers will begin to emerge on Sunday! Aidan McAnespies re-captured the Pat O'Brien Cup from the Wolfe Tones with a fine display over the 60 minutes. A great display from corner forward, Cian Tobin helped the Macs on their way. Gareth O'Neill, Cronin Dempsey, Niall Gallen and Darryl Brolly also put in sterling performances for the northerners. The Tones struggled to find any kind of flow to their game, while it was the opposite for McAnespies as they played some nice fluid football, found each other well, and looked the hungrier of the two teams. After a dream start to the game for the Tones, McAnespies took control of affairs and left their opponents in their wake. Marty Kelly netted shortly after the throw in, but McAnespies answered with a point from Cian Tobin followed by a goal from corner forward, Darryl Brolly. Cronin Dempsey and Gareth O'Neill controlled matters in the middle third of the field, while Kerry native, Cian Tobin proved to be a dangerman at corner forward. Tobin accounted for six of McAnespies eight first half points, four were from frees as the Tones were forced into persistent fouling, and looked surprisingly sluggish throughout the half. As the scoreboard kept ticking over nicely for McAnespies, the Tones searched for answers in the forward line but were instead left with a lot of questions. At the break it was a handsome 1-8 to 1-1 lead for the red side of South Boston. The Tones tried to get the second half started on a better note than that in which the first ended, and succeeded in shaving two points off the deficit. Mike O'Brien, Brilly, and Marty Kelly tried to generate some lift for their team and a close finish looked like a possibility for the first 10 minutes after the restart. That all changed with one well played ball to the Tobin's corner, with the killer blow coming from Enda Hamill. After fielding the cross field ball Tobin turned to make the opening for Hamill and the wing back slid the ball neatly between the legs of Tones keeper Cathal Hynes. Gary Brilly answered with a fine point, however another three pointer from McAnespies put the matter to bed. Aidan Lynch was fouled in the penalty area and put the spot kick away himself leaving no doubt as to the destination for the cup that night. Just under two weeks before the championship and it is Aidan McAnespies making the noise early in the season. Tones: C. Hynes, C. Gartland, K. Gill, D. Maguire, B. McShea, M. O'Brien, C. Joyce-Power, J. Kelly, C. Carr, G. Brilly, M. Kelly, M. Farrell, D. McCabe. Macs: P. Coakley, M. Bogue, E. Delmar, N. Gallen, C. McClean, A. Lynch, A. Fearson, C. Dempsey, B. Smith, G. O'Neill, E. Hamill, D. Brolly, C. Tobin. Spoke with Denis O'Brien of Gaelicsportscast.com and updated him on developments on the Boston scene. Aidan McAnespies and Wolfe Tones meet in the Pat O'Brien Cup final which is scheduled for next Sunday, May 12. Each side has had a smooth path to the final game, with McAnespies having defeated Donegal and Galway along the way, while the Tones had easy wins over Cork and Christopher's to get there. It could be argued that the Tones, one of the better home based outfits in Boston, are favourites to retain the Cup. The Tones beat Donegal in last year's final which was not played until the championship was well underway, but this year the final game will feature a vast majority of home based players. With the likes of seasoned veterans Gary Brilly, Mike O'Brien, Collie Carr, and Marty Farrell, along with Cormac Joyce-Power in the lineup, the Tones have some inter-county experience on the field. Added to the squad this year are Marty Kelly, Barry McShea, and Danny Egan who beef up an already impressive lineup. Aidan McAnespies have had the upper hand over the rivals in recent years and driven by Gareth O'Neill, Marty Bogue, and Niall Gallen will be looking to continue that trend. However, the Tones might have the horses to recapture the first trophy the season has to offer this year. The Boston Open Handball Tournament takes place on Saturday and Sunday May 4 and 5 at the Boston Athletic Club in South Boston. Semi-Finals and Finals take place on Sunday. Young star Killian Carroll from Mallow will be participating, while Mike Snyder, Billy O'Donnell from New York, and Sam Kass from California are alos entered. Local players John Sheppeck, Eamon O'Leary, and Peter O'Connor from Sligo will be flying the local flag. Admission is free.